Based at the Renton Municipal Airport, the King County Sheriff's Guardian One Air Support Unit flies five helicopters but only this one, a Bell Jet Ranger 206 from 2012 is newer than 40 years old. The unit despite proving to be vital to both law enforcement and a range of other missions, must make up a budget shortfall with grants and has no plan in place for funding replacement aircraft. 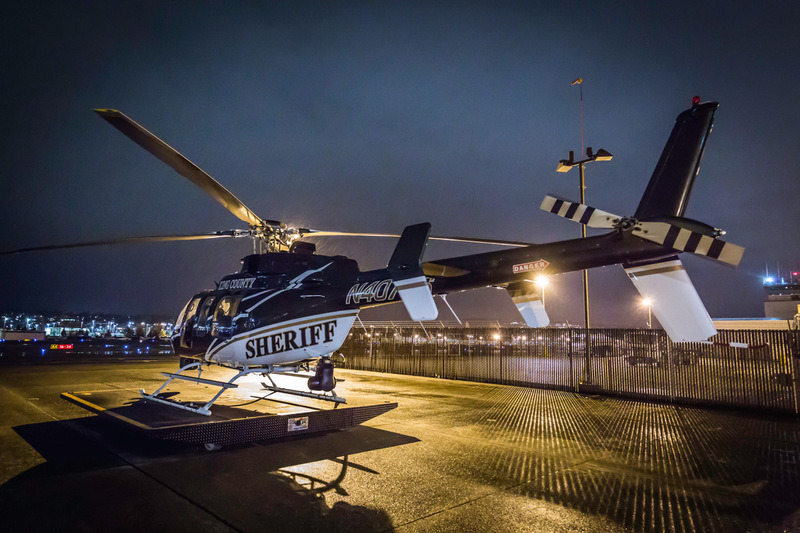 If you’ve ever been curious about a helicopter flying overhead you might be surprised to know that it’s often King County’s Guardian One, part of the King County Sheriff’s Office. The Air Support Unit (ASU) as they are called has a wide ranging variety and area of service with the primary mission to provide support to ground based law enforcement. But that mission’s future is anything but certain. The King County Sheriff’s Office (KCSO) portion of the General Fund is 21 percent, the largest single component but the Air Support Unit (ASU) which has 5 full time employees gets a budget of just under $600,000 a year, despite costing nearly $800,000 annually. To meet the shortfall the unit relies on a number of grants. The ASU faced significant General Fund shortfalls in the 2017-2018 budget. The Sheriff and King County Executive Dow Constantine agreed to eliminate the ASU to preserve adequate response times to 911 calls. But a special Ordinance was passed that preserved it. The King County Council passed Ordinance 18403, for what is known as a “franchise fee” on utilities using County right of way. The fee provided enough revenues for the ASU to continue operations. Although the ASU operates helicopters that support activities throughout the region, it is entirely paid by the County’s General Fund. The General Fund faces structural deficits as property tax revenues are capped at 1 percent annually, but inflation and population continue to grow much faster. Eliminating the 1 percent cap so that the County can properly fund the ASU and other County functions remains the county’s top legislative priority in Olympia according to King County Executive Dow Constantine. Guardian One operates five helicopters, but four of them are more than 40 years old. Only one was built within the last ten years. At this time there is no plan in place to acquire new helicopters and the team must work hard to maintain that aging fleet. The four pllots who serve as the eyes in the sky are trained sheriff’s deputies but their daily work might require them to make the 12 minute trip from one end of King County to the other to assist law enforcement on the ground, or in a rescue mission in the mountains. They must have three years of patrol experience and then go through a period serving as a Tactical Flight Officer. Law enforcement officials in every local jurisdiction understand that in a regional emergency the ability to respond quickly via air is vital. In 2014 for example they played an important role in the OSO Landslide in Snohomish County. In the event of an earthquake, many of the region’s concrete bridges could fail making access to neighborhoods extremely difficult. The ASU is the only full-time law enforcement helicopter unit in the state. In 2015, the ASU executed 15 search-and-rescue missions, rescued 25 people and recovered three bodies. Half of the rescues were in King County. Also in 2015, the ASU supported the KCSO in 799 law enforcement operations, and assisted in approximately 82 captures. In 2016 the ASU played a significant role in 59 arrests and more than 91 in 2017 so far. Because they can and do fly anywhere in the state the ASU flew 425 law enforcement missions for other jurisdictions in 2015. For search and rescue it’s not uncommon for them to go to Chelan, Whatcom, Mason, Kittitas, Yakima, Okanagon and Skamania Counties. In addition, they are used under contract by the Coast Guard and WA State Department of Ecology to support responses to oil spills.